In June 2019 we will be celebrating our official 4th birthday (and our unofficial 6th birthday—where has time gone?). We are so grateful to everyone who has joined us at different times along the way! After our humble beginnings at the end of 2012, we moved from La Trobe Street to Rankins Lane in heart of Melbourne. We were fortunate to relocate our single studio into two separate studios in the same lane. We still continue to operate the only TRX Studio in Melbourne, today. As we have from the very beginning, we still run semi-private sessions (small group) 6 days a week. We also offer Private Training from 1-on-1 to Duos and sometimes Trios. In 2018, Prenatal Private Training became a part of our repertoire as did Halo Sport from Halo Neuroscience. Halo Sport is a Neuropriming headset that “works by applying a small electric current to the area of the brain that controls movement–putting it into a state of hyperlearning“. Our studio clientele are comprised of a small, dedicated community. Through their different goals they are united by one thing: valuing their physical ability and health. Whether its strength, tone, building lean muscle or working on flexibility, there are endless benefits to physical activity. This includes improved cognitive function, better moods, stronger immune systems, bone density and so on. At the end of the day, we all want to keep doing the things that we love, for as long as we can. We invite you to join us. Tell us about your aspirations in an informal chat at either of our studios. We consider our approach as being holistic (and passionate, of course). You may be surprised at what you find along the way. Apparatus Private Studios are focused and dedicated to the health and well-being of our clients. We provide Private and Semi-Private sessions, and general sessions to our Members. Our Studios specialise in TRX & Halo Sport Neuro Strength and Conditioning, run by TRX Master Trainer and Ambassador CJ, an officially certified TRX Instructor covering all TRX modalities including: TRX Suspension Training, TRX RIP Training, TRX Yoga Flow and TRX Functional Training. We are also dedicated to Pilates, offering Reformer sessions & working with auxiliary Pilates apparatus. Members and clients who attend our sessions, come to re-connect and learn about themselves, both physically and mentally. They also find that they are more capable than they realise, and that movement and building strength is a self-investment for life. It is something that translates into every day. We offer challenging 30-60 minute sessions through TRX Suspension Training, TRX RIP Training, TRX Yoga Flow, TRX Functional Training, and TRX Core Balance, as well as Pilates with apparatus including Reformer. At Apparatus we also enjoy the finer points of our exercise system techniques to ensure that clients build a strong foundation. Physical effort only tells half the story. Finding balance and long term lifestyle sustainability is at the heart of our studio philosophy. We believe in making better choices because you can. Because you want to be in the best condition you can be, to do the things you love for as long as possible. And yes, you can still eat cake. Our studio is open from 5pm, Monday-Friday prior to our evening sessions. Make an appointment for an informal chat with us today. Private and Semi-Private Training is by consultation and appointment only—available 6 days a week. We also provide Corporate Training, Health and Well-being workshops, as well as On-site Training. CJ’s career has crossed back and forth within the fitness industry for more than 15 years through strength and conditioning training, management, nutrition, program development, consulting and rehabilitation. With a strong understanding of what it means to be at a physical disadvantage through his own experiences of sporting injuries, accidents and rehabilitation. Each client has different requirements, and with the understanding of the effects that daily life has on health, CJ’s holistic approach with clients is one of keeping it simple and honest. Both with setting realistic goals, and knowing when to push boundaries to get results, whether it be for professional sports, life goals or general health and well being. Being fit is not just a matter of physical conditioning. Achievements through exercise can boost confidence, and be a great foundation for an overall positive mindset in life. 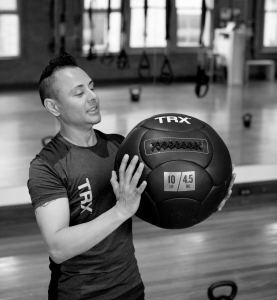 CJ is the first Officially Certified Master TRX Trainer in Australia and New Zealand, specialising in TRX Suspension Training (ST), TRX RIP Training (RT), TRX Functional Training (FTC), TRX Yoga Flow (YF), TRX Core Balance and also a Pilates Matwork instructor with a background in Dietetics, Nutrition, Strength & Conditioning, Sports Medicine and Sports Psychology. and has had the pleasure of undertaking courses and instructing at the TRX Training Centre HQ in San Francisco. CJ attended the first International Trainer Summit in Athens Greece, in the pursuit of continued education, new coaching systems and techniques as well as learning from some of the industry’s leading educators, minds and senior Master TRX Instructors from around the World. CJ continues to attend summits (Baltimore, Hong Kong, Texas) and is the process of finalising his certification as a TRX Educator. Pilates Matwork & Small Equipment, Pilates Reformer & Auxiliary Apparatus, TRX Suspension Training, TRX Group Suspension Training, TRX RIP Training, Barefoot RehabRX Level 1. It depends on the energy of the session. Both CJ and I like to get a sense of our how clients are feeling. That said, I like to mix it up. Sometimes sessions are a little more focused with a moderate pace, sometimes they have more flow, but they always have a chuckle. Regular clients know I absolutely empathise with how challenging Pilates (which is my primary focus) can be. I like clients to be challenged and to recognise why they are being challenged, but as always, practice safely. Through Pilates, I am passionate about the benefits it can deliver to clients in a focused, yet enjoyable class format. You can expect to be challenged, encouraged and develop a greater body awareness. Sedentary work environments, poor eating habits (leading to lack of energy and motivation), muscular injuries related to sitting, running and training. Pilates Semi-Private, Private and Corporate Training. Pilates is an exercise of many layers. The concentration not only connects the mind and body, but also brings deeper awareness of how are muscles are performing through simple movements. This also translates into every day life. Regular Pilates practise can increase pelvic and spinal stability, correct muscles imbalances and improve posture. Pilates is suitable for all levels, with programs also available chiropractic, osteopathic and physiotherapy clients where directed. Get in touch with me today for an informal chat at our Pilates Studio on Rankins Lane.